"From one enchanting aspect to another, in ceaseless procession – never an unlovely one..." In 1878 Mark Twain settled in Heidelberg, where he wrote about the Rhine Valley... mountains rise abruptly from the water's edge, ancient castles perch aloft, gentle valleys calm, age-old winelands lure, spas give respite, cathedrals inspire, plains and woods catch the eye, and a great river runs through it – connecting centuries of history and crossroads of thought. You'll see it all – and enjoy a Tauck Exclusive evening at Ehreshoven Castle! Tour begins: 4:00 PM, Amsterdam. A transfer is included from Schiphol International Airport or Amsterdam Centraal railway station to your riverboat; check-in time aboard ship is 4:00 PM for all guests. Join your fellow river cruisers for a discovery briefing this afternoon when you'll hear about your river travels ahead, followed by a welcome reception and dinner aboard your riverboat to celebrate the start of a fantastic journey. You will be cruising aboard an Inspiration class riverboat, custom designed by Tauck to cater to your comfort with the most space and suites on Europe's rivers... and a non-stop parade of riverboat delights that may surprise you. In a city indelibly linked to water, it's fitting that your day begins with a cruise on Amsterdam's 17th-century grachten (canals), which fan out in crescent-shaped rings from the northern waterfront. On the drive to board your canal boat, you'll hear an orientation talk on the historic city, which at its heart feels more like a village than the compact centre of a cosmopolitan city. Landmarks include Centraal Station, built at the end of the 19th century and still a place in constant motion – with people, bicycles, trams, and buses; De Waag (Weigh House), once a fortified gate that today houses a popular outdoor café; and the Mint Tower, a gate in the city wall (circa 1400) that marks the intersection of two canals, tram paths, a pedestrian-only shopping street, and the outdoor city flower market – an ever busy, ever interesting crossroads. Aboard the canal boat, you'll glide beneath curved bridges filled with pedestrians and cyclists, and sometimes trams and cars, passing by the narrow houses of merchants who pragmatically stored their goods on the upper floors, safe from flooding. After a guided visit to view the prized collection of art at the world-renowned Rijksmuseum, drive to the old university town of Utrecht where your riverboat awaits. Have lunch onboard and enjoy insightful commentary as your riverboat cruises through the gentle Dutch countryside en route to Germany. A cocktail hour, dinner, and an evening activity in the ship's lounge add to the day's fun. Overnight your riverboat crosses into Germany. Spend the morning relaxing and taking in the scenic sights along the river as you prepare for afternoon arrival in Köln (Cologne), a city that was the capital of a Roman province as long ago as 50 AD. Sightseeing here begins with a guided walking tour of this city on an intimate scale to discover its pedestrian-only shopping streets, abundant cafés and traditional beer halls. There are medieval churches, avant-garde museums, and the waterfront on the River Rhine. Today's shore excursion includes a visit to the immense twin-towered Kölner Dom, whose construction took a mere six centuries. Completed in 1880, this Gothic cathedral was declared a UNESCO World Heritage Site in 1995, in recognition of its cultural value as "a testament to the longevity of faith." Afterward, if you like, join us for a visit to the Romano-Germanic Museum (closed Mondays) adjacent to the cathedral. The collection contains examples of art, culture and everyday Roman life along the Rhine. Highlights include the Dionysus Mosaic, once the floor of a Roman banquet hall, which lies exactly where it was found in 1941, when workers were digging a World War II bomb shelter. The museum also possesses the world's largest collection of Roman glass and a miniature portrait of the Roman Emperor, Augustus. Tonight enjoy a Tauck Exclusive evening at Ehreshoven Schloss, a Baroque moated castle just outside the city set in a castle park with 18th-century French gardens. The memorable festivities include cocktails, dinner, and local entertainment. Welcome to Deutsches Eck, the "German Corner," where the Rhine and Moselle rivers meet and the beautiful city of Koblenz is situated. The city's roots go back to the Middle Ages, when its location made it powerful and rich as the controller of trade along these major waterways. This morning you have your pick of two activities: an orientation tour of Old Town Koblenz with your Tauck Director... or bicycling* on easy riverside trails through forests, meadows and Riesling winelands, taking in views of the passing pleasure boats and freighters. Bicycling is a countrywide passion in Germany, so you're bound to see the locals riding too. Return to your riverboat for lunch and sail on this afternoon. 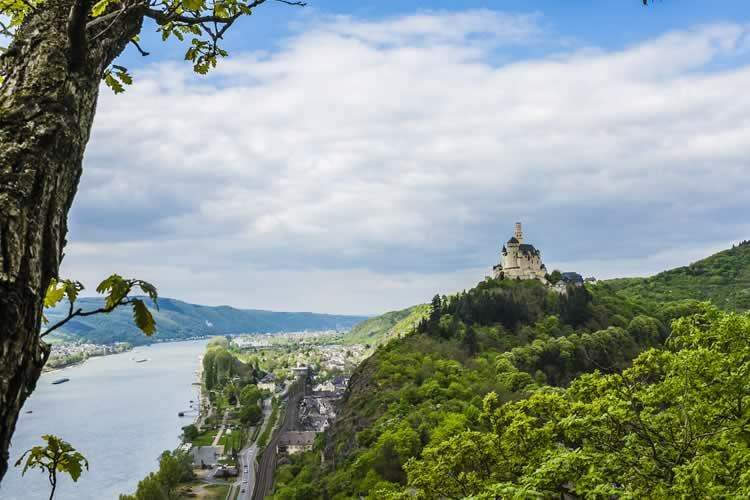 As you cruise through the quiet Rhine River Valley, noting the small cities, churches, ancient walls, and castles along the way, onboard commentary informs you about the history and geography of the river. This afternoon also provides an opportunity to relax and enjoy the amenities onboard your "floating hotel." Dip in the plunge pool, practice on the putting green, hit the fitness centre, visit the hair salon... Enjoy onboard entertainment as your riverboat continues cruising the Rhine tonight. Spend the morning observing the beauty of the passing landscape from your riverboat. This afternoon you'll have a choice of sightseeing activities. One possibility is to get to know Speyer. For centuries the Rhine River was a major transport hub and a source of wealth for many, through trade and taxation; Speyer thrived on trade in the 10th and 11th centuries. That's when the construction of its amazing double-domed cathedral began. When you see the cathedral, a UNESCO World Heritage Site, you may be surprised by its natural glass windows, rather than stained glass, and the roof made entirely of stone – the first ever in Europe. Buried in the crypt are some 300 years of early German emperors. Next, on a visit to the city's impressive Technik Museum, you'll find exhibits dedicated to every form of technology that moves, from vintage cars to the Russian Buran space shuttle – and a Boeing 747 jumbo jet and U9 submarine that you can go inside. Afterward, relax over a refreshing bier at one of the town's many inviting biergartens, a Rhine summer delight. Your other choice of sightseeing is an excursion to Heidelberg, Germany's oldest university town. Narrow lanes, shops, and pubs housed in 17th-century structures in the Altstadt (Old Town) are lively with the cadence and activity of student life. On the hillside above the city, you'll visit the romantic ruins of Heidelberg Castle, an inspiration for painters, and celebrated in writing by many, including the German poet Goethe and Mark Twain, who both spent time here; Twain wrote about the striking red sandstone ruins of Schloss Heidelberg in A Tramp Abroad. This once-grand palace was a home to Bavarian royalty from the 13th to 18th centuries. Today you'll find an imposing ensemble of buildings from different architectural periods, reflecting the architectural ambitions of successive owners, surrounding a central courtyard. From the castle's terrace and gardens, the sweeping views of Heidelberg and the Neckar River Valley below are amazing – as is the feel of 600 years of history. Your riverboat docks on the Rhine today surrounded by the hills of southern Alsace, many checkered with vineyards. Your morning introduces you to the Alsatian cultural capital of Strasbourg, France, where centuries of being passed between German and French control are reflected in the dual languages and atmosphere of the city. Strasbourg is home to the charming canals and half-timbered houses of La Petite France; stately city residences; a Gothic cathedral; and plenty of winstubs, traditional Alsatian wine rooms. The city skyline is punctuated by the modern offices of the European Parliament and the European Court of Human Rights; along with Geneva, Strasbourg is one of only two European cities with these kinds of international institutions. The afternoon offers a choice of activities. One possibility is to head for the German resort town of Baden-Baden on the edge of the Schwarzwald (the Black Forest), where you'll visit the Caracalla Spa for a pampering experience devoted to wellness and relaxation. Spa facilities include whirlpools, waterfalls, counter-current pools, massage jets, and pools of warm water sourced from natural springs. Add in a sauna complex with both hot and cold rooms (some wellness treatments are at additional cost) and you'll feel like a million bucks at the end of your visit. If spas don't interest you, choose to take a walking tour of Baden-Baden with a local guide. You'll discover a charming town that became especially popular in the 19th century among society types and celebrities who were drawn here to take the waters, attend the horse races, and try their luck in the famous casino, the opulent Kurhaus, built in the 1820s. Tolstoy, for instance, set part of Anna Karenina here (although he gave the city a fictitious name), and his fellow Russian novelist Dostoyevsky penned The Gambler after compulsively playing at the Kurhaus' roulette tables in the 1860s. Enjoy free time in town before heading back to your riverboat. Welcome to Switzerland! Mountain scenery, shimmering Lake Lucerne, and forests and meadows are in store for you today if you choose to come along on our excursion to Lucerne. In this "city of lights," you'll see its landmark sights: the Kapellbrücke – Chapel Bridge – a covered wooden footbridge crossing the Reuss River that dates back to the 1330s; an octagonal Water Tower once used as a prison; and lovely squares, like the Kornmarkt, Weinmarkt and Hirschenplatz. In Altstadt Lucerne, narrow cobblestone lanes lead to town squares lined with houses painted with frescoes. From town, you'll ascend to the heights of Mt. Pilatus on the world's steepest cogwheel train ride, climbing nearly 7,000 feet from Kriens to the very top – Oberhaupt. In the event that weather prevents ascending (or descending) by cogwheel train, we will go up and down the mountain by cable car. Either way, getting there is definitely part of the fun, as you're surrounded by views of Alpine meadows, mountain streams, and flowering fields along the way. But instead today you may prefer the pleasures of a wine tasting and lunch along the Alsatian wine route. If so, you'll head to Château du Haut-Koenigsbourg, originally built in the 1200s on a rocky promontory above the French Alsatian plains; it's an ideal – and strategic – spot for observing comings and goings. Burned, abandoned, and then restored to its former glory in 1899, the castle presents a picture of a mountain fortress of the Middle Ages, brimming with beautiful details. A tasting of Alsatian wines and lunch at your choice of local restaurants completes the afternoon. Regardless of your choice of excursion, your day ends with time spent as you wish in Basel, which lies at the centre of the "Three Corners," where France, Germany and Switzerland meet at the River Rhine. Along the Rhine Promenade, broad steps feature cafés with views of the city skyline and the Romanesque Münster Cathedral. In fact, walking is the best way to experience Basel. From the 16th-century town hall, painted in red and gold, to state-of-the-art works of modern architecture along the Rhine – by internationally acclaimed architects like Frank Gehry and Yoshio Taniguchi – you'll find while exploring this small, charming city on your own that Basel has been a crossroads of travel and thought since the 15th century. Join us onboard this evening for the captain's farewell reception followed by dinner. Tour ends: Basel. Disembark your riverboat this morning by 9:00 AM. A transfer is included from the riverboat to Basel's EuroAirport Basel Mulhouse Freiburg or Basel SBB Railway Station. Fly home anytime. Allow 3 hours for flight check-in. For guests wishing to spend more time in Basel, please ask us at booking about additional hotel nights. All private Tauck shore excursions – £660 Value!